When it comes to diagnosing and treating disease, the big names like cancer and heart disease tend to draw the majority of media attention. Yet it’s estimated that there are over 80 different autoimmune diseases affecting approximately 23.5 million Americans1, and there is neither a definitive understanding of the cause nor an effective cure. Autoimmune diseases, like rheumatoid arthritis (RA), systemic sclerosis (SSc), and systemic lupus erythematosus (SLE), can affect multiple organs and tissues, cause long-term pain and discomfort, and will progress through phases of remission interrupted by unpredictable flares or relapses, accompanied by significantly elevated morbidity and mortality. It is this inherently complex, syndrome-like nature and numerous overlapping symptoms that make diagnosis such a challenging endeavor for clinicians. In the early stages of these diseases, patients can present with uncommon features, often suggestive of an entirely different autoimmune disease, yet remain undiagnosed due to an inadequate number of qualifying criteria2. 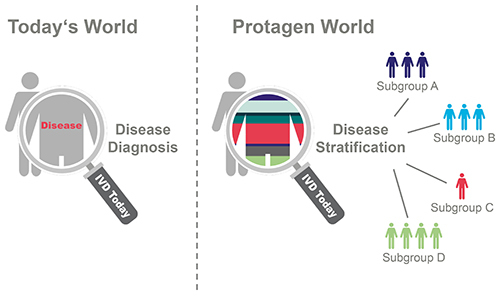 Despite the array of diagnostics (Dx) available, a biomarker capable of predicting autoimmune diseases with sufficient accuracy remains to be identified3.